Finally there was a reason to watch WWE again because Dean Ambrose finally won a belt fair and square without having to steal it. Dean Ambrose is now the Intercontinental Champion and these are my thoughts about it. Expect a few exciting words, also because of something that took place on the RAW show that followed TLC. I haven’t watched anything about WWE since my latest rant that was the open letter to WWE. I just watched the Table For Three episode I have written my little take about it. But apart from this – niente. And I haven’t missed it because the last I’ve seen Dean Ambrose played the lapdog for Reigns and I couldn’t have it. 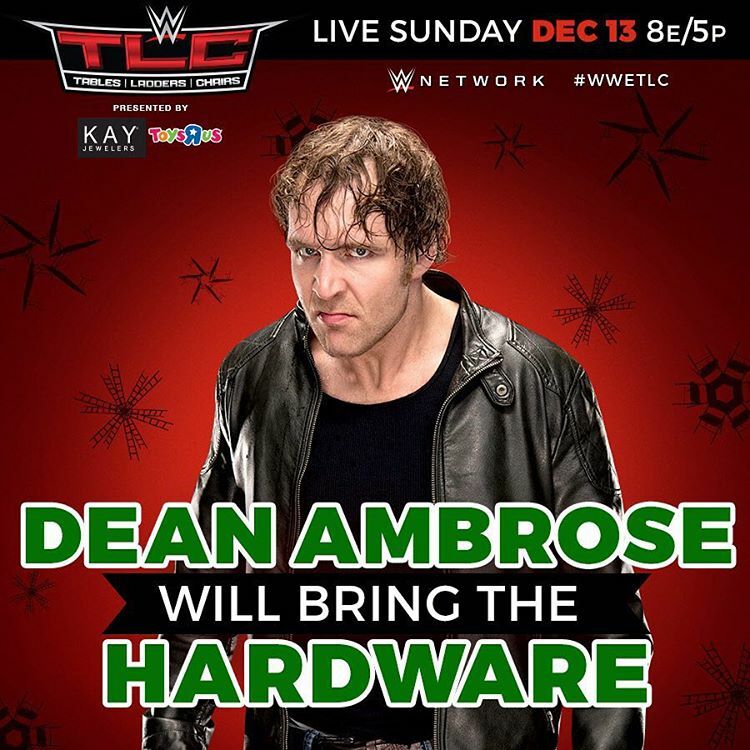 I was still slightly informed about the shows because of some Twitter followers, so I knew about Dean Ambrose’s match at TLC. And I really thought that WWE would screw him over for just another time. But they finally gave in, didn’t make Dean Ambrose into a complete fool with stealing the belt again but actually make him win this match. I do like matches between Kevin Owens and Dean Ambrose, two former Indie wrestlers, of course and they both have their unique style that you can only teach and learn with years of experience. And they both seem to click very well. They’ve got a great chemistry in the ring and that was mostly visible in the final sequences of their title match at TLC. First of all I was slightly confused that Kevin Owens as the champion came out first. But he had something to tell us before his match, so that might have been the reason. It wouldn’t have been possible for him to cut such a promo with Dean Ambrose already in the ring. So. Kevin Owens told us one very true thing that I also don’t really get, that people who watch sports claim they won something when only their team won. And he said that Dean Ambrose winning against him, also wasn’t achieving something but that was just a fluke – as it turns out later, Dean Ambrose didn’t win with his finisher but with a roll-up from the set-up to the Pop-Up Powerbomb, so maybe that’s the gimmick of that storyline between Dean Ambrose and Kevin Owens: can Dean Ambrose win against Owens fair and square, i.e. with the Dirty Deeds, so Owens isn’t able to argue any more? 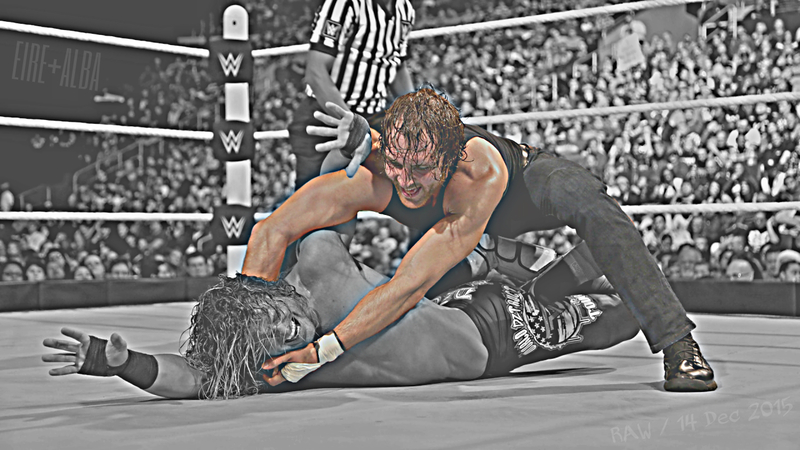 I still hope that they add more depth to this storyline, but knowing WWE they won’t and leave it that way. Now the match between Kevin Owens and Dean Ambrose lasted for 9:53 minutes which isn’t that long, so there’s hardly time for good storytelling. But there were a few good spots, also good counters and the match came around with a really good finish that was breathtaking and certainly with a nice surprise. When Dean Ambrose finally hit Dirty Deeds on Kevin Owens, the following save by Owens was almost missed because Owens just barely reached the ropes with his fingertips. 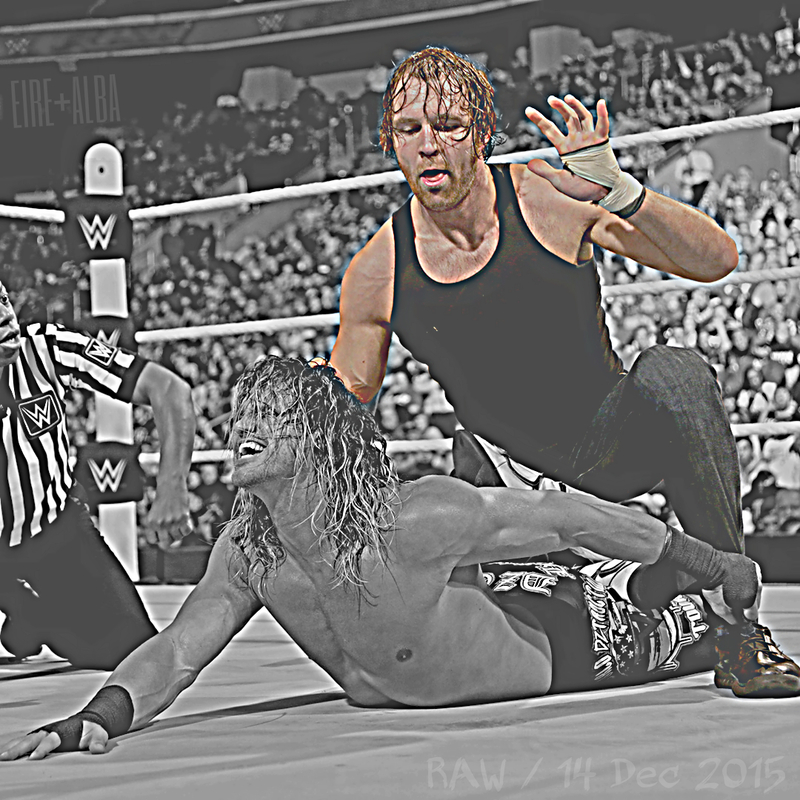 But Dean Ambrose kind of saved this spot with over-the-top selling of his frustration. That also was the reason for Owens coming back to life. He set up the Pop-Up Powerbomb but Dean Ambrose countered for the roll-up and finally got the three-count for the win. And he lost no time for his celebration with the fans. He climb outside the ring and threw himself into the first row – kind of message and /or reminder for Cesaro who is currently injured? Would be very nice and I certainly took it this way. 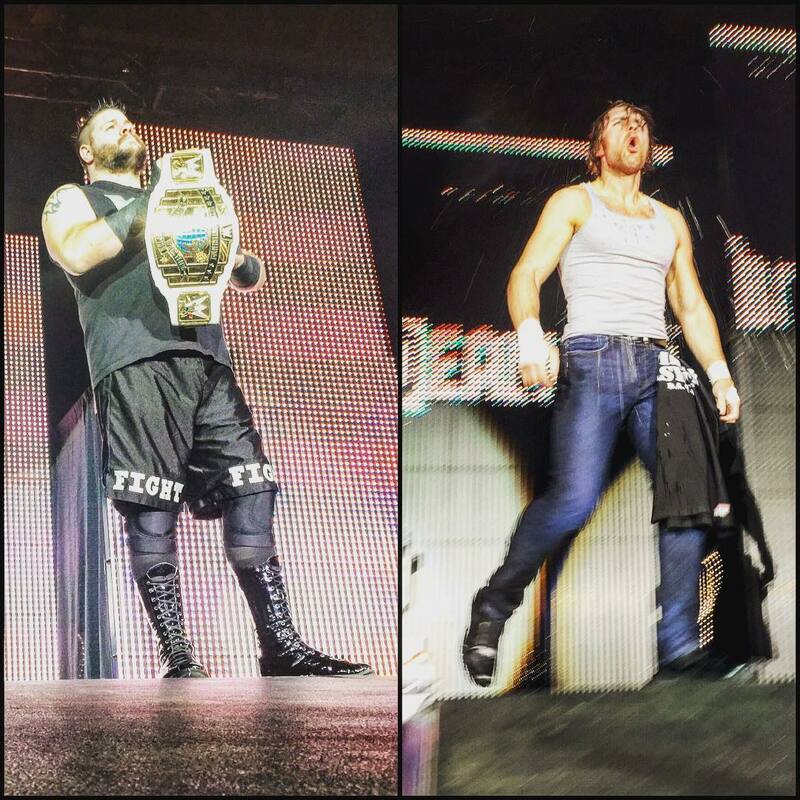 But Dean Ambrose came back inside the ring to present himself as the new Intercontinental champion. “Pat Patterson! Matcho Man Randy Savage. Bret “The Hitman” Hart. Ricky “The Dragon” Steamboat. Thirteen year old kid who collects video tapes, tapes over them, steals them from the blockbuster video […] eight hour tapes dubbed over, over and over and over watching these guys do what they do, setting an example, being the workhorses, being what you dream of being when you dream of being a professional wrestler. That’s what I have always aspired to become. Somewhere along the line things went off the rails a little bit. And we live in WWE in 2015 and men like to cheat! And they like to get disqualified on purpose cause they just wanna walk around with this. They don’t want to represent this! You know what I’m saying? It’s a strange, strange world we’re living in today, alright? So, of course Dean Ambrose wants to be a fighting champion. Let’s see if WWE let him or if JBL gets just another reason to moan about that Dean Ambrose would never defend his championship. In any case I’ve already started a new page for his Intercontinental Championship run. Let’s see how long it lasts. As you might still remember, I haven’t watched anything of WWE since my last rant that was the open letter to WWE. So I have no idea if Dean Ambrose had used the Regal Stretch during that time. What I do know is that he teased it for quite some time with the stretching of his opponents’ legs but then only went for the head without stretching their arms as well. This is the first time after FCW when Dean Ambrose was in the middle of his feud against William Regal that I see him using the Regal Stretch and what shall I say. I freaked out for a moment. I had one of this fan moments that mean more to me than a big win or Dean Ambrose finally getting his Intercontinental Championship. Because the Regal Stretch is one of my favourite holds ever, it’s a connection between Dean Ambrose and William Regal and it’s just great that Dean Ambrose finally uses it. … and there it is, the Regal Stretch! I was slightly annoyed by the commentators who didn’t say a word about this hold and what it means. And I was even more annoyed about the audience in Philadelphia that was basically dead at this very point. At least they chanted “This is awesome” at one point and it really was a good match, fast paced, with some good spots and good moves – besides the Regal Stretch. It took 11:45 minutes with one commercial break in between and ended in disqualification in favour for Dolph Ziggler when Kevin Owens came out to attack the guy. Then Owens let out his frustrations on Dean Ambrose over losing the IC title on him the day before. Two Pop-Up Powerbombs on Dean Ambrose later, Dolph Ziggler attacked Owens but only to end up powerbombed on Dean Ambrose. Now this sets up a triple threat match between these three guys for the Intercontinental Championship at the Royal Rumble, I guess. And if so neither of these three guys will have a say about the outcome of the Royal Rumble match for the number one contender and the main event at WrestleMania in 2016. Some people already predict Brock Lesnar to win the Royal Rumble. But I doubt it. Recently Daniel Bryan was speaking about retirement, so it’s more likely to me that he will coming back to win it. But whatever is planned for the Royal Rumble or WrestleMania, I don’t really care because Dean Ambrose finally is the Intercontinental Champion plus (even more important), he finally uses the Regal Stretch. I couldn’t be more happy in wrestling terms really. 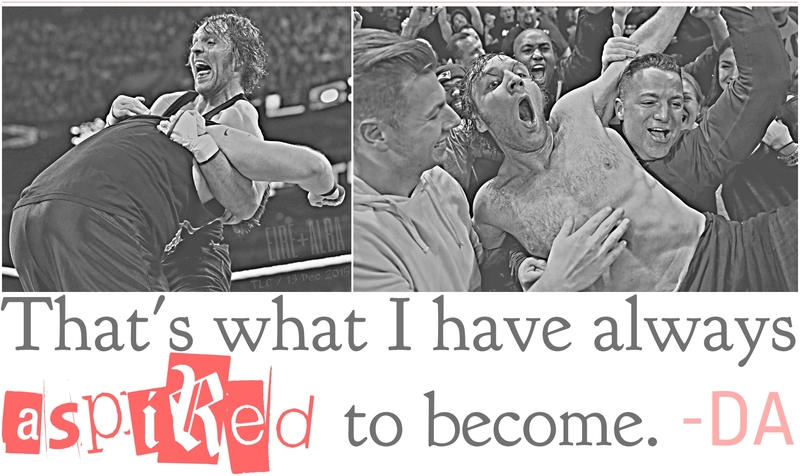 I won’t write regularly, maybe cover the PPVs or just shows with Ambrose defending his belt. But him finally using the Regal Stretch is already a highlight of his reign, even if that possibly means that William Regal is now officially retired. Of course you write whenever you like! I mean when you do, we are always entertained reading whatever you write! It’s kind of interesting that Mr Regal just flew back to the US and won’t be part of NXT TakeOver: London plus cancelled the rest of his one man show tour. Of course he had to do that because of his recent neck operation. But it’s still an interesting coincidence with Ambrose using the Regal Stretch for the first time. Yes, he’s probably one of the kindest person living on this planet. He recently posted a rather graphic post operation picture on his Twitter account and said a few words about it. He did have the first op last year and looked really bad after it with his voice sounding bad either (there’s a short sequence of him on the Shield documentary that was probably shot just after the op). He’s got a scar from that op on the right hand side of his neck. The recent op was planned and recovering didn’t seem to be that bad, even if the scar is far bigger than the neck one. You’re welcome 🙂 You should probably follow his Twitter account. It’s really worth it. Thanks for clarifying what that move was! Now that you mention it, I’m not surprised that commentary would gloss over it since JBL was too busy complaining. I love that Ambrose seems to randomly pull out surprisingly technical moves but it almost never gets called out. Yeah, usually they only mention something that happens in the ring when it’s important for the storyline. So they weren’t really able to mention that this move was the Regal Stretch and that William Regal invented it. They would have mention this if William Regal at some point in the recent future would have a storyline with Ambrose. But it’s still a shame that this move passed almost unnoticed. At least I haven’t seen it mentioned on the dirt sheets or in wrestling forums. And the only thing JBL is doing is moaning anyway. So that’s no big surprise. When William Regal was doing commentary in FCW, he always called such moves, referred to the past and told some stories. I really miss that kind of commentary because the WWE commentary is basically useless and adds nothing at all to the matches.